Our top tips for charities using Twitter are based on 18 months of testing and learning. 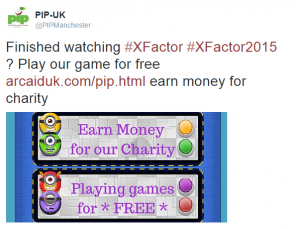 At PIP-UK we have discovered Twitter is a great networking tool where you can learn useful hints and tips from other small charities. Today we’d like to share what we’ve learned over the last 18 months. After trying and testing out lots of different tools, techniques and ideas. We participate in a twitter hour e very Wednesday just for charities. Basically you use the #charityhour every Wednesday between 8pm and 9pm and retweet others using the same hashtag. There is usually a theme and around 5 questions asked over the hour by host @CharityHour Lots of different charities get involved but also people and organisations who support charities. For example there is a regular attendee who is part of the Learning and Development community, a PR company keen to help smalll charities at a reasonable price and many more. One of our trustees wrote a useful guide to Charityhour last year which helps you set up and get the best out of the hour. We have made lots of excellent connections and some real friends here. Many not from our particular sector but beneficial contacts. Seems obvious right? But what does it actually mean. Well you need to actively stay in contact with your network. Dropping them a message every now and then asking how they are doing. Retweeting some of their tweets. Setting up lists is a great way to stay in contact with those that matter most. Encouraging small charities with their campaigns and sharing ideas / knowledge with them. For example if a small charity is looking for ways to improve their followers on twitter you might do a special shout out tweet for them or send them a link to an interesting article that you found. As with most social networks its all about sharing and giving. The more you do this the more you will get back. Our following is quite small but we have quite a few people we can call on for advice about how to approach things. Word of warning when using trending hashtags you want to be sure you are aware what the real message is behind it. We’ve seen some examples where it’s gone horribly wrong. Well, there’s alternative ways to get round this. Videos are a great way to get lots of information across in Twitter. They play directly from the tweet. We have used YouTube mainly for our test and learn activities. But Vimeo works as well. Our best discovery as we have a lot of information to share on Twitter was using slideshare. This is a great little tool that we use on our website too. The slides can be viewed from within Twitter itself meaning the reader doesn’t have to come out of Twitter to view it. There is also a tool you can you called TwitLonger which enables you to write a lot more. Scheduling some tweet s for Twitter frees up some of your time. There are lots of tools which enable you to schedule tweets. If you search google for twitter tools you’ll be inundated with them. Lots cost a fair amount of money which for charities with little or no budget it’s just not possible to sign up to them. However, there are lots of free ones to try. Using tools to schedule tweets means you can spend time engaging with people who retweet, connecting with your network and responding to questions from people on twitter. 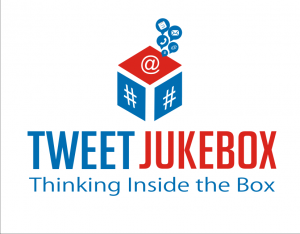 We’ve tried lots out over the last 18 months trying to find the ones which work best for us TweetJukeBox is the one we’ve just started trialing recently. It’s really helped us to continually get the message out there about Poland Syndrome facts. In just a few days we have already seen more retweets than we usually do. Some others we like are tweetdeck and futuretweets. Both are free to use, tweetdeck allows you to add pictures whereas future tweets is just text. 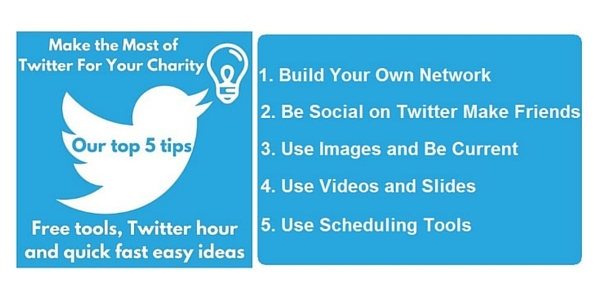 This is our list of top 5 tips for charities using Twitter. We are always learning new things and trying out new tools and techniques. Happy to hear from anyone who has useful tips for Twitter or other social media platforms. We look forward to seeing some of you at Charity Hour.